Bass: That's the move I would play myself. However, it seems that we are running out of soldiers (it's been three days already), so I propose we resign this game at this point. Does anyone oppose? kanzenryu: I couldn't find a better move to propose, but it does seem that we are firmly behind and that enthusiasm is running out. I'd love to be able to start a new game. Bass: Allright, let's concede this game then. Thanks to all soldiers who were there to the end! dry? : So where was the losing move? I think it was in the upper left. kb: Please see my comments on the game, and in particular. dry? : Sorry for the mis-typing, I meant the upper right, even earlier. I thought was the mistake, we should have connected. And kb is also right, in the sense that is a very slow move. schroeder: Same reason as for , I suggest L12 (a). kanzenryu: C8 (c) Ko fights seem less likely to me now, so we shouldn't be too worried about using up some of our threats. Bass: I choose (a). As kanzenryy points out, (c) is a waste of ko threat. (b) is big, but gote. Please try to keep the point value estimates coming, there simply is no other way to play endgame. kanzenryu: Actually I was trying to point out the opposite ;-) I just can't tell if these things are a good idea or a bad idea. Bass: Yea, I kinda figured that :-). The thing with this kind of ko threats is to play them just before the opponent would want to defend. To white (c) is worth either 1 or 2 points (depending on who gets A10) in reverse sente, so white would want to play (c) approximately when the biggest gote play is 3 points. (The oversimplified rule of thumb says that a pure gote play is worth half of a reverse sente play of the same size). Therefore a good time for us to play our sente move is approximately when the biggest gote plays are worth about four or five points. kanzenryu Bass, thanks for your careful explanations. I don't know about everybody else, but I am learning a lot. schroeder: I will try to count. Correct me, please. I'm terrible in counting! Q1 (a) is 2 points, with a 4 point followup. b16 (b) is 5 points, with a 2 point followup -question: in my counting for (b), how should I consider A16 and A11? O5 (c) is 4 points with no followup. L12 (d) is 4 points with a 4 points *sente* followup. Thus my suggestion is L12 (d). kanzenryu: Could we not play (a) and then play (d) afterwards? schroeder: If we play (a), then S2 becomes a 4 points move with a 2 points followup for black, whereas (d) is still 4 + sente 4 points. So I think that white would answer (a) with (d) (unless there are bigger moves on the board, but in this discussion I'm assuming is not). Bass: I choose a. It is never good to play this kind of hane on the first line and then not connect. or in other words, if (d) is better than (a) now, then B157 was a mistake. But I think we are fine here. kanzenryu: R1 (a) more double sente... and now to count... a 3 point threat in gote with a 5 point follow up (I think). isd I think we're at least 10 points behind now. dry? : (b) is good, but I don't think it's sente, because W can either connect or make eyes. (a) is good but we should push through at (c) first. After that, b16 (d) seems to be the most urgent point. DragonYao: In no hurry to play (c), it is our privilege and too gote for white as of right now. Maybe K8 (e) is sente for us, will increase aji of the move (b). Plus it looks sente too. Bass I choose (a), it has a follow-up (5 points is not far from the mark) that is not smaller than any of the of the other suggested moves, and that should make it sente for us. Because its point value is 3, white might want to play that move sometime soon, so now is a good time to play it. Isd's comment brings up the question: do you guys want to play this to the end? If you won't give the point value estimates for the suggestions, the exercise will feel somewhat pointless. DragonYao: R9(a) seems the best way to connect. kanzenryu: R8(b) another choice for a connection. DragonYao: Sorry... is there a reason we haven't played a move yet? Maybe we should get some more suggestions out there for Bass. Bass: I was waiting for more suggestions, but I think we've waited long enough. I choose (b), it makes O5 slightly more pleasant for us. Ted O'Mari: Raise the stakes first, then run the sequence. B3 (b). dry? : I agree with Ted. I wanted to suggest (b) on the last move but didn't get a chance because it went by so fast. dry? The danger is that W may move out at F2, but we can clamp at G2 etc -- is this what everyone has been refering to as the "sequence"? DragonYao: Before you guys do anything rash, I suggest F2 (c). This eliminates the risk of the ko, and white can't push, as his pushing stones would die because of the corner aji. If after F1, white simply captures, we would either have to play F2, or allow white a worry free ko (or give white two moves elsewhere, clearly bad at this stage). That's the sequence =). DragonYao: In fact, I'll just go ahead and play it. It is part of the tesuji sequence discussed earlier. playing F1 becomes our privilege after this move, as does the ko for the E1 stone. Exchanging B3 for B2 doesn't change the situation, so this is an unnecessary exchange that is better utilized as a large ko threat. So I'll go ahead and choose (c). JoazBanbeck: And I'll just undo it. We have no concensus here, and no captain. At least one is required to make the move. When I said that we needed someone to blame the loss on, that was a joke, ok? It was not a request to become blameworthy. dry? What a disaster! W E1 was a mistake, giving up sente, but now we've given sente back, and the territory too. I suggested B D1 many moves ago, sente for us, which would have prevented this. Now W can take S7, a double-sente move that wouldn't exist if my earlier elementary suggestion of pushing through at S7 had been followed. We should just resign. DragonYao: ... Not sure what you are talking about. Sure we could tenuki here, if we want to lose at least 8 points in sente next turn. W E1 is a classic double sente move. dry? W E1 is not double sente. It is gote. DragonYao: Sequence, or it didn't happen. White has a huge follow up of F2 if we don't respond. BTW S7 is ONLY sente if you want to give white the option of taking that stone (and R7). Other than that, it's doesn't give black any more points in this area. Bass: Dry, please try to keep the drama down a bit. First of all, white did not get E1: we can capture it any time we want. Secondly, S7 never was sente for us, now was it? dry? Hi, Bass, thanks, but I don't understand what you are saying. If we had played D1 in sente when I suggested it, W would have had to answer at C2, which is at least 3 points better than the current situation. Yes, we can capture E1 in ko, so it's worth about 1/3 point. Not a good trade. dry? On the right side, I'm also not sure what you're saying. Pushing through at S7 is elementary. It doesn't gain sente, but it prevents W S7 from being double sente on the next move. That's the point. Am I misreading something here? tapir: Imagine White ignoring the hane and splitting the left side group of black off. Can the black group live? Even if it lives (probably in gote) - may that lose more than 3 points done in damage to the left side and middle territory? After S7 and a white answer, what can black later do against white R8? JoazBanbeck: Assuming that Yao meant "throw in at D1(a)", I suggest it. DragonYao: Indeed I did (thank you). It's the only way to take advantage of C3. I don't think we need much more time for other suggestions. Next couple of moves are kind of a one way path. JoazBanbeck: Assuming further that Bass is asleep right now, and will be for hours, since he endorsed the sequence last move, I'm going to brevet myself again and choose it. DragonYao: Wow. Looking into how to answer this simple hane has provided a very interesting reponse. I think we should cut at C3 (b). They are forced to respond at C2, after which we could make the throw in of C1, forcing them to eventually capture C3. They cannot resist by extending after C1, as their crawling stones would die if they were to connect after b2. Responding here is at least 10 points. If white gets next move, he will play F2, which is disastrous to our territory. Bass: I choose (b). This is the tesuji we were aiming at when we pushed here earlier. w148 needs answering, so I'll not wait for other moves. JoazBanbeck: Assuming that they play 146 at Q9, we have to connect in sente. As discussed in the notes to move 145, we are behind and the only way to catch up is to get several big moves in sente. I think L13(a) works. I'll post details later. DragonYao: I just joined this team, albeit a little late =). I think you mean Q11, Joaz. Anyways, I like the idea of L13, assuming white does connect the atari, however, I think we are likely to end gote here anyways. Perhaps N13(b) directly would be best, leaving any reduction techniques in the L13 area in reserve. JoazBanbeck: Welcome, Yao. It is good to have another player join. We need somebody to blame if we lose. :) And, thanks, I did mean Q11, which they have now played. DragonYao: Indeed, I think this game is very hard for black at this point. White seems to be ahead on the board already. On second thought... maybe we can play O12 (c), aiming at creating eyeshape and reducing white's endgame potential of W O11, as well as staying connected and perhaps creating liberty problems we can exploit later in the Q13 group. kanzenryu: O13 (a) It's eye time we connected. JoazBanbeck: I guess you mean O13(a)? But they can answer with Q9, thereby capturing our two stones at R10/S10 for a profit of about 10 points. I suggest that we take Q9(b) first. kanzenryu: Not connecting makes me very nervous. If white cuts at O13 and gets a throw in at N10 then I think we die. How does everybody else read it? JoazBanbeck: Go is not a game for the nervous. :) If white leaves the Q10 stone hanging and cuts, then we capture at Q10. This changes P9 from a false eye into a real eye. Then they can cut and play at N10 if they wish, but we still get an eye at N10 and an eye at P9 ( and a nice sente at S11 ). But connecting right now abandons ten points on the right side and thus is the equivalent of resigning. kanzenryu: I guesstimate that white is about 15 points ahead at this point. JoazBanbeck: Sigh...I count 6 points plus komi. Which is pretty close to your estimate. But there is a silver lining. The lower right is our sente, their gote. The upper left is dual gote because we can run to N18. The lower left is our sente unless they want to start a ko. So, if all goes well we get two points in sente in the lower right, four in the lower left. Hmmm...still not good enough...maybe we get b15 for another five points. kanzenryu: The good news is I can kind of count things now. dry? : I suggest pushing through at (c) before connecting. Bass I choose (b). Joaz is correct, we definitely cannot give these stones to white. (a) certainly connects, but it does not do anything else at all, so it is not the optimal connecting move. (c) is also an example of a standard good move, it tries to create a shortage of liberties to white, so we may get our connection in sente. JoazBanbeck: S10 (a). It is big - 12 points, I think. If they get there first, it is sente. kanzenryu: C8 (b) More as a counting exercise than anything else. It gains one point in sente, and has a followup of 14 points ending in gote. Bass: (a) it is, then. 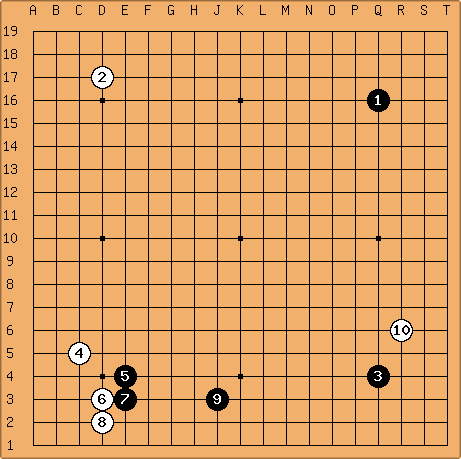 (b) has a huge follow-up, which is characteristic of a sente move. The small gain means that white is not going to play it any time soon, so we can delay that move and use it as a ko threat later, should such a situation arise. (c) had no point value estimate, but I think we can agree that it is pretty useless without (a) in place. schroeder: I think (a) is the biggest move now, but let's suggest R1 (b) as an alternative. Ted O'mari: ok, D1 (d). L18 is still bigger. Bass: I choose (a). If we do not defend here, then F18 becomes a wasted move. Regarding the other moves, please do try to make some kind of an estimate for the value of the move, it is a vastly useful exercise. If you think your guess might be wildly off, then it is even more important to give that estimate for others to consider. All the suggested moves were good ones, by the way. And good job on suggesting alternate moves even when you all found the correct one. kanzenryu: I've been trying for a few of the simpler looking threats. So far I have not been able to count anything at all. I just can't figure out the sizes of the follow up threats. It certainly is a worthwhile exercise. I can't believe how hard this is/how bad I am at this. It's no wonder I have never counted anything during an actual game. kanzenryu: Okay, let's try counting D1. If they move first we lose 2 points of territory. If we don't defend their followup threat is large (I couldn't read that part accurately). If we move first they lose 4 points. If they don't defend our followup reduces them by 7 and gains 4 points of territory for us. So I count D1 as 6 points in double sente with an 11 point followup for us and a large follow up for them. Corrections/confirmations from anybody? tapir: There is a lengthy discussion about D1 for black or E1 for white on the white subpage. kanzenryu: N17 (a). I've been trying to count this one move for a while now. I still can't figure it out. I think because it prevents white playing L18 and L19 that it's worth 4 points in gote, and makes a sente threat of 4 points itself. Is this even close to right? Bass: I choose (a). Instead of waiting for suggestions, let's study the approximate endgame value of (a) a bit. Here's a possible sequence of play when black plays first. It is up to you to decide whether it is the best sequence for both. Then I chose some arbitrary borders for the territories I want to count. It does not matter which borders you choose, as long as you use the same borders for both cases. Also, the counted area should be be big enough to contain both the sequences. Here the black points are circled and the white points are marked with a square. This sequence gives the result "black has 4 points more" (8 vs. 4), and the sequence is gote for black. (that is, 3 black stones vs. 2 white ones = cost of 1 black move). Again, here's a possible sequence, and you need to find out for yourself whether it contains any mistakes by either player. Here black has 2 points and white has 8 (the captured stone counts double, while the point above it doesn't count, because white will eventually have to play there. Also, since black can atari the stones in sente, the point where white has to connect is not counted. So here the count is "6 for white", and the sequence is sente, or in other words, there are as many black moves as white ones. So the difference between cases A and B is 10 points, and 1 move. Since the black sequence was the gote one, the value of move (a) is said to be 10 points in anti-sente. All this assumes that the sequences are the correct ones, which you cannot really tell besides by reading everything very carefully. kanzenryu: F18 (a) Get the obvious one out of the way. Bass: As we have now clearly entered the endgame, I would like to see some kind of point value estimate (or even better, calculation) along every suggestion. That is, "Z29 (g), X points in double-sente" or "U40 (h), Y points in gote with a Z point gote follow-up". Or something along those lines. This is the only way to judge between various endgame options. kanzenryu: Great suggestion! Prepare for some hilarious incompetence on my part, however. kanzenryu: Okay, this prevents a Monkey Jump, which is 8 points, but is reverse sente in gote or something, so that's 0 points in gote defending against losing 8 points. Is that even close to right? JoazBanbeck: S7(b) is another monkey jump, but it protects a group that might someday be more desperate for eyes than our group up top. It also threatens to invade white. How big is it? The same size as (a). Kirby: Well, I've gotta say, endgame counting is one of my major weakpoints... I guess I had better study it more before being able to make any suggestions. thanatos13: I like (a), but the tower peek at L14 (c) of 0 to -1 points in sente might help both the top and the right. Bass I choose (a). kanzenryu, if a move prevents opponent's 8 points move, then it's worth 8 points. More below. (b) is also very big, good work on spotting it. However, we might want to play a couple of sente moves before taking it. I do not see how (c) would be useful, and it forces white to take an important point at L15, so let's not do that. cost difference of 0 equals "sente for either player"
cost difference of 2 moves means "gote for both", or just "gote". (cont.d) The only trick you need to know is that if there is a one-sided sente follow-up to the sequence, you will want to consider those moves belonging to the original sequence. JoazBanbeck: The white stone got connected in the direction that it wanted. So I'm getting paranoid with E10(a). kanzenryu: F11 (b) continue with what I had planned. Bass: I choose (a). I also thought F11 would be useful, but then I read again, and noticed that we actually cannot cut at G13 unless we have (a) in place. (G8 would hurt too much.) So let's first defend, and we'll get F11 anyway, since it is somewhat sente for us and gote for white. Kirby: As per previous analysis, I couldn't find a way to connect in sente, so (a) seemed like the best choice to me (given our choice of c10, that is). I thought about the e12, hane, crosscut situation mentioned below, but I'm afraid of: e12 f12 f11 g11 f10 e10. If we don't protect the g8 cut, w will be able to capture the three h7 stones, which would be terrible. But if we protect the g8 cut, then w can play d12 to capture the e12 stone, and we still have to connect in gote. Also, if we let them capture with e12 f12 f11 g11 d11 f10 it is also gote for us, because then we need to protect the g8 cut, again (unless we don't care about giving up some stones, but it seems kind of big. kanzenryu: F12 (b) my feeble attempt at reading this suggests it might work some of the time. JoazBanbeck: My feeble attempt at E12(c) might work also. Some of the time. Especially when it is something like B:E12, W:F12, B:E10. Ted O'Mari: Play like samurai. We can live in the upper left. A4 (e). Kirby: BTW Joaz, I am not trying to shoot down your idea (since you mentioned "feeble attempt" now, I hope that I didn't hurt your feelings). I'm just stating my analysis in words, and I hope that it's not interpreted in the wrong way (as writing sometimes is). JoazBanbeck: It's cool. If my move has faults I want you to find them. kanzenryu: Actually the more I look at F12 (b) the more I think it works. If white attempts to cut us at D10 we always seem to be able to capture his cutting stones. Can anybody find a good way for white to answer? Kirby: @Joaz - that's cool. I just wanted to double check. @kanzenryu - I assumed w would E12 in that case, and the connection has still not been made, but I've drank a little bit tonight, so migh ideas right now might be whack. Bass I choose (b). If white answers correctly, we will gain nothing, but the losses are also minimal. So let's see what they can come up with. Kirby: This move is kind of annoying. I want to connect in sente, but I can't seem to find a way to do it. At first I thought, to compromise, the best sequence was to start with c10. In that case, if white protects the stone at b10, then we could play e10, which gives one of two possibilities: black sente or the possible sequence shown below. However, after more consideration, I think that simply playing at d10 (a) in gote is better, because we have the possibility of b8 later with this option. White may try to stop us by playing at c10 to eliminate the b8 aji, but in that case, he hurts his e11 stone, which is good for us. fractic: Instead of connecting right now how about making some points with B16 (d). Bass I choose (c). White will naturally have to defend (else the cut becomes meaningless), and then the possible cut becomes a huge liberty eating move for white, and a boatload of new connection options will become available for us. Kirby: This is one possibility for white and black if we started at C10. Kirby: Since we went ahead with playing D4 for the last move, we should probably play D1 (a) while we're at it. I really hope that, in the future, we get the opportunity to play D9. It seems pretty big to me. JoazBanbeck: D9 (c) is gote, but it is a big gote, and it is their sente. It also eases life & death issues for our upper left group. (cont'd.) (a) is a very good endgame move, but a white play at (c) is probably sente against our group, so we have to play it first. (d) is a good idea, but it does not actually help us as much as it seems: as long as we stay connected, white cannot exploit our weak spot very well at all. JoazBanbeck: The threatened stones can run after we get the big double sente at E18 (b). fractic: I don't think (b) is sente for us. Let's play D4 (c) and then play hane at D1. dry? : I think (b) is double-sente in an endgame sense, so it's a big point, but it doesn't threaten to kill, and W(b) doesn't threaten to kill either, so it's too soon to play it. In fact, as things wind down, W(b) is probably W's privilege, because it threatens a bit more than B(b). dry? : W126 is big but is not absolute sente, so this is our chance to pick up some double-sente moves elsewhere before coming back to answer at (a) or (b) or M16 or whatever. I suggest D1(d), keeping (c) in reserve as a ko threat. dry? : The more I look at it, the more I agree with Joaz that our response in the upper left should be (b) not (a). If W then jumps into our little UL space, we can answer at D10. We want to play there anyway. dry? : Summary of suggestion: play (d) first, forcing W C2, then (b). Bass: I choose (c). This move is more sente than D1, and it makes it impossible for white to play the hane at E1. It would have been nice to have had other suggestions for defending our left side group, making eyes is so boring.. The mentioned double sente is, sadly, more sente against us than against white, so we need to be very careful with the timing, gote is still worth sligthly more that the couple of points available there. schroeder: O2 (a). At least, now R1 is our privilege! Kirby: I second (a). Playing O3 is worse, because w has the option to either play a ko that's dangerous for us, or simply fill and get sente anyway. kanzenryu: D14 (b) Threaten something first. Bass: I choose (a). It is not likely that white will prevent the suggested forcing moves very soon, so we would be wasting ko threats by playing them now. dry? : I think the safest approach is to connect underneath with N2 (a). After W captures we must answer at O2 or O3, so W keeps sente. I think we still have an small overall lead in territory after this, but I'm not sure. A small compensation is that, after O2, R1 becomes sente for us. dry? : The more aggressive approach is to capture at M5 (b). W will probably answer at O2 or P2, cutting off our lower right stones. We can answer at O5, setting off a big semeai, but as far as I can see, we lose it. So I still suggest (a). schroeder: Since only one suggestion per person is allowed, I vote for M5 (b). Dansc: If after (b) white makes a ko with N5, we can play O3 - white takes ko - N2 - white connects - O2 and R1 is our sente. Or we can fight the ko and play N2 whenever we feel we have no more threats. If white tries N2 after O3, I believe we can just connect the ko and white loses the semeai. So I'm all for (b). JoazBanbeck: Dansc, I really want this to be true. I hate playing submissively with N2. Are you absolutely sure that we win it? Kirby: Since we played at L4, it seems slightly inconsistent to play N2 (a) now, because before, we either could capture their cutting stone, or get away with sente. Now, N2 (a) will probably end in gote. In that sense, a move at M5 (b) is more consistent with L4, in my opinion. However, if we play M5 (b), white doesn't have to start the ko at N5. One option for white would be to play O3, which would be hard to deal with... So, I think that I'd still play N2 (a). kanzenryu: O3 (c) I'll chip in a clueless suggestion. Kirby: O3 (c) may not clueless like you say. For example, if white were to play N2 in response, we can capture and come to a shape similar to the scenario that Dansc describes above... I'm really curious to see how this is sequence is going to pan out... I can't wait! kanzenryu: I don't want to nag, but I think we should try to keep the game moving along rather than waiting for a better suggestion. It is only a learning game after all. JoazBanbeck: Let's not give Bass whiplash. :) Maybe we could settle for one play every 24 hours? If Bass makes the move at about the same time every day, then all of us can check in once a day and know that we get to contribute. Bass: I choose (a). Looks like white found the move to force us to play N2 after all. dry? : If W then connects at M5, we can play O5, saving a stone and firming up some territory. W keeps sente but hasn't gained anything. So W will probably try something like O4 instead. The pushier P4, which we answer with O3. The aggressive O3. I fear that this leads to seki, at a great loss for us. ( see diagram below ) So we may have to fight and win that ko. Bass: It's (a) or nothing. Kirby: Can you discuss why you disliked playing N2 immediately? Is it because you don't like the N2 L3 M2 L4 L2 sequence? I thought that was OK since we capture their cutting stone if they play that out first. Or, if they try to save their cutting stone first, they end up in gote. With the concerns that are drawn out in the diagram below, there seems to be more risk by playing (a) to me. Bass: Well, mostly I wanted to avoid playing N2 at all :-) Maybe other soldiers could share their view on L2, as they can discuss more freely? JoazBanbeck: L2 is a fine move. We don't mind giving them L3. In fact, we welcome the exchange, because it means that they are going the wrong direction. The important direction here is eastward, not westward. The vital point in the position is O4. And white will get there first. So we are probably screwed. What really pisses me off is that I was going to suggest O4, only to find that a move had been made less than 8 hours after the white move was posted. kanzenryu: I think that's probably the first thing in this conversation that I could actually understand. ;-) I can't even figure out why either side is playing a ko. Kirby: Just so I understand what we're discussing, L2 at what point, Joaz? Do you mean if we played N2 initially, like I asked about? I took a look at the implications of playing O4 initially. I think that it has the benefit of disallowing white to get the point. White can make a bit of a semedori by playing M2 and O2 in response, though... Anyway, when we're talking about L2 most recently, are we talking about the one in N2 L3 M2 L4 L2, or L2 at a different point? Also, if O4 is the key point, to me it seems that, if we play N2 first, either we get that key point, or white takes gote. Either of these choices seem fine to me. But to answer your implied question...was N2 a better move than the one chosen? I think so. Kirby: Thanks for your explanation, Joaz. I think that your approach is extremely interesting. I have never thought about classifying the "nature" of each move, as you describe. Rather, I basically read from intuition, without this kind of analysis. I think that your approach could be quite beneficial for reading speed. Have you always taken this approach ("Lucretian go")? jvloenen: I agree with your analysis. After white 'a', white creates a seki in sente and connects at Q7. End of game. I think white will not delay playing this, as black can connect in sente, forcing white to Q7. If we do not connect with , white will have a flower ko, so we cannot even play 3 in this diagram. JoazBanbeck: But not playing 3 ends in disaster. Shall we submissively play 3 at N2? They capture and we must finish in gote. I think we must fight the ko. Ok, we lose the ko, but we then have sente for a bunch of big yose plays. Keep in mind that we are currently ahead by 15-20 points, and there are a handfull of big yose plays worth at least another 20 points collectively. If we give up a 20-30 point ko threat, but get most of the remaining yose points, we are still ok.
jvloenen: Do you really think we're 20 points ahead? About 5-7 points before this last exchange I counted. (The white team used some function of kgs, which I think is wrong). The problem is we cannot win the ko, as white has some very large threats. We don't have any threat larger than the ko. And the corner is just too big, so not winning the ko is not an option. And if we cannot win the ko, we better not start it in the first place. JoazBanbeck: We do have one semi-internal ko threat at R5. I say 'semi-' because it saves the lower right group, but not the lower side territory. We win the ko, giving up a ko threat somplace else, end with sente. Lose the ko, taking the best ko threat they will give us, lose the lower right too. Avoid the ko, playing N2 and another protective move in gote. Do these seem to describe the situation? Kirby: (a) seems like the obvious move. Anything less seems too passive. Kirby: Yes, feel free to flame me. Bass: Agreed. This is more or less a wasted ko threat for white, and we have no other imaginable responses, so let's keep the game going. Dansc: Defending is so boring. Let's just play a big move at E18 (c). JoazBanbeck: Defend before they play something like E10 and get our group into serious trouble, but make a few points while doing it. D9(d) connects because of the weakness at C8. Ted O'Mari: Keep sente with F12(e). Bass I choose (a). We need to defend our group somehow, and (a) is the only suggestion that properly does so. (d) is a good try, but white can play C10 to cause really annoying aji in our position. My favourite would have been a play at C10, which would have solidly defended our group because of the B8 aji. (e) is probably sente, but white would get good endgame almost everywhere before having to actually defend against the cut. The D1 hane is not so urgent as the R1 one, see if you can figure out the difference. fractic: C11 (a), enlarge our eyespace. JoazBanbeck: It looks like one of my colleagues has already found the best move, so I'll suggest something vulgar. B-10(c). Bass: I choose (a). It was a good suggestion for our previous move anyway, so let's not complain when white forces us to take it. This move enables some fine tesujis on the side, and if black blocks them, we get the option of connecting to our center group while threatening to make some more points in the process. fractic: E2 (b), very big endgame. JoazBanbeck:...but, since I have a move to suggest, I'll blindly try the aji-laden C4(c). I'll leave it to Bass to determine if it works. 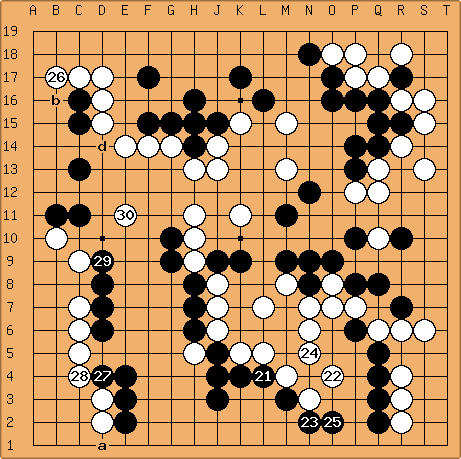 kanzenryu: Is our C16 group safe enough to play E2? Bass: I choose E2 (b). White's one space jump here would gain white over 10 points in sente, and now the hane-connect endgame here is our sente. (finding our best defense against the white hane at E1 is left as an exercise :-). The C16 group will live, it can either go to the corner or to the side at (a), which is why we cannot play (d), it would ruin the possibility of (a) for us. (c) wouldn't work. kanzenryu: Are we in danger of losing a group after a clamp at M18? Bass: In the spirit of the game I'll try to answer this in a very general way only. There are two ways to save an endangered group: connecting, and making life. Assuming we can be cut from the center group in sente, the question you need to ask is "does M18 at once prevent us from both connecting and making life?". If not, then the clamp itself is not dangerous to us, and we only have to work out its endgame value for the opponent (X points in sente/gote). Then, we have to do this evaluation for our possible responses, which I think you already have done for at least one of our options :-). Joaz Banbeck: Not being a captain, I can give a more precise answer. We reply at N17. He must connect under at N19 ( ok, he can play M17 too but it transposes ). Then we clamp him with L18. Now M17 and M16 are miai. Ted O'Mari: R10(a) Take their territory and make it our eye space. JoazBanbeck: N13(c). With plans for the eye-destroying L14. Bass: I choose (a). The center group needs defending, and besides these three moves I do not see any plausible options. (a) is best, because it severely punishes white for letting us temporarily off the hook. If white prevents our connection, it will be in gote, and we will have a definite eye in the center. Therefore we can now play endgame on the right side as long as it threatens to make at least one eye for us. Best of all, if we manage to create half an eye on the side in sente, we get a free tenuki. So, instead of our having to scramble for life, it is now white whose hands are tied. JoazBanbeck: O12(a). We no longer can think of living by connecting south or by killing their center group. We must run or make eyes or kill the weak white stones to the north. I haven't even read it out, but O12 looks like it contributes to all three. Dansc: N12 (b). I believe this way we can either connect or make enough eyespace to live in the center. Ted O'Mari: E2 (c). Abandon them. Take 20+ points with E2. They capture. We take another 20 points with C8. kanzenryu: F12 (e) prevent an eye and threaten a cut. Bass: I choose (b), let's make eyes. D is also a good option, but it is a bit more dangerous, so let's secure the group first. Also, I do not think it is going away anytime real soon. And here in the middle of the comment where the enemy spies will not bother to read it, I may dare to hope that we can later harass the other white center group, which is why I also like (b). (a) is problematic, as w can answer at (b). Tenuki is not an option right now: if we die here, the game is over. Dansc: P10 (a). Can't let them cut. kanzenryu: P9 (c) here's another alternative, but I can't shake the impression that we're doomed anyway. Bass: I choose P10 (a). We need to keep our connection to the right hand side while maintaining the potential for the cut. If white wants to connect, this move also gives us a sente eye in the center starting with (d). (c) connects, but is a worse shape, and (b) has many shape problems, which seemed to amount to our utter destruction at a first glance. (d) is a fine move, but white can switch strategies and just cut. If we were happy with only connecting the center stones out, we should have done that much earlier, when white had no option of taking the whole right side with one move. dry: Q8 (a) seems to require W to respond inside, and enlarges our group. kanzenryu: Q7 (d) threaten some connecting ourselves. Bass: Hi again, a lot has happened here, I notice :-). I choose Q8 (a). While no move here actually cuts, this one threatens to cut while keeping open our access to the right side, which will hopefully be worth at least an eye, not to mention all the points we have to prevent white from making there. (b) and (d) would let white cut us with an atari at P9, and O11 is the wrong shape: white can prevent both the connection and any eye potential by playing the vital point at N12. We seem to have fallen behind because we have invested a whole move in rescuing the cutting stone near the tengen, so we have to play every move to the risk limit here: if white gets plenty many points here in sente, we will be in points trouble after white destroys the left side. So let's see if we cannot lay waste to white's prospects here. JoazBanbeck: They push through at P9. kanzenryu: P8 (b), although I also wonder about trying to connect our centre and top-right groups (but I'm sure they can cut). JoazBanbeck: Locally, P8 is best. But just for variety I'll suggest L8(c). Dansc: O12 (d). If they cut, we can make some eye shape. jvloenen: I choose (b). We add a stone to our weakest group. It's the best we can do. Q9 (a) will be answered by Q7. L8 (c) isn't sente, so white answers around P9. O12 (d) doesn't connect as you stated. If you want to create eye shape, don't play a move trying to connect, hoping for eye-shape as by-effect. Better play a move creating eye-shape in sente, because it threats to connect. So locally I would prefer O11 over O12. kanzenryu: We probably need a more accurate count estimate to make that decision. jvloenen: I choose (a). No explanations needed. Joaz, do you really think we can kill the center group? JoazBanbeck: No, not against best defense. ( If I thought that we could, I would have posted it ) But we can invade the right side - their best option for big territory - while chasing it. The question is: when to tenuki? kanzenryu: P8 (a) Close the kennel (okay so I'm stretching it). JoazBanbeck: Surround the prey with P8. schroeder: Why don't we wedge in N8 (b), instead? They have to answer N7, we connect, they protect the cut, and after this we can play P8. jvloenen: I choose N8 (b). A local move is urgent of course. P8 (a) gives white more possibilities (white will probably play N8). Note: if white answers at N7, P6 will be on the right spot already (so white will not answer at N7). dry: I agree with the choice but I don't understand your comment. Where can W play next if not N7? W can't just sacrifice this group. jvloenen: You're right, forget the last comment, it doesn't make sense. kanzenryu: K9 (a) It's a dog eat dog world. JoazBanbeck: And white is puppy chow. K9 is the only move. Ted O'Mari: K9. Woof, woof! M16 (b) to protect against the cut at N17 (gote, but maybe forced). E2 (c) to grab compensating territory (also gote). dry: My personal vote is for the consensus move (a), to keep sente. We're dealing with the consequences of failing to connect against the P17 peep, so we need to be aggressive, I think. JoazBanbeck: Welcome. No, I'm not co-captain, even though I may be strong enough to be one. BTW, you can make only one suggestion per move - although you have some catching up to do so I don't know if anyone will object. jvloenen. Welcome to the team dry%%%We had only one suggestion (with 8 teammembers). So I decided to wait for more (and I think K9 is wrong - for several reasons). In general I think it's better to give alternatives, even if you think a suggestion done before is best, or even the only move. M16 (b) isn't big enough. The white cut at N17 is gote. So white will probably play M18. We just don't have the time to do a small gote move. E2 (c) is small gote too. The difference between white jumping in at F2, and the E2,E1,... sequence isn't big enough at the moment. I don't like . It makes our stones heavy. If we could capture white, it would be great, we can't however. White can wedge in at L11, and capture two stones (if we connect, white captures M11 and things are even worse: we need to connect on dame to the P7 dragon, giving white stones around P10, and white gets a large territory on the right side with Q13). I would like to play 97 on P8, or N8. We would connect our stones, and the right side would never turn into white territory. If white defends on K9, our J9 stone will still have aji. We can use the aji by playing G11 later (maybe probe at L14 or K12 first). JoazBanbeck: We are now entering a fight for sente. P16(c) may be best. It creates eyespace in sente. See my extensive comments below. fractic: If you are going to play P16 why not play R18 first? That way O19 will also be sente. JoazBanbeck: Because it is double sente. See last three diagrams in comments below. kanzenryu: Can we consider playing at K9 (a) to get the initiative back? JoazBanbeck: This is a strong move. But P16 has to come first, because they can do it in sente if we don't. See the new version of the extensive comments. fractic: I still don't really care about playing in the center and will sugest C8 (b). schroeder: I like Joaz analysis, so I support P16 (c). But I add a bookish suggestion on M17 (d). kanzenryu: We should probably play something... we should try to avoid taking this long. jvloenen: Ok, time to move. I choose P16 (c). I don't agree with the analysis below however. First is the missing move , which can have a huge effect on the outcome. Suppose white has defended on L9 or N9, what happens? This analysis has another flaw imo, I think if we play on N16, we simply connect and (giving some points to white again) we don't have to struggle for live. C8 (b) is very big. It is gote however. White will attack our 4 center stones, and capture the stones or get a large profit on the right side. So we need to help our center stones first. K9 (a) must be played if we can kill white. I don't believe we can. If we play (a), we'll have 5 stones in trouble. We need to reinforce first. M17 (d) saves a second line stone. This is not big enough at the moment. First, with at P16 we make room for an eye at P15. They have to defend at . We then attack with , like Kanzenryu suggests, strengthening our middle group. They defend somelplace in the lower half of the board with (not shown because there are so many possibilities). Then we tenuki with to something big like (b) or (x) or (y). I prefer (y) myself because it further endangers their central group. Wherever we play, it is about 15 additional points. That, BTW, is the whole point of this post. Let them cut with . Then we save our upper side territory with . At this point, we are still threatening to save our corner with N16. They play there with , cutting us off. Now, here is the fun part... We start running with , they block with . They will think that they can kill us. We run with , they enclose with . We start encircling eyespace with , threatening to make two eyes with O15. So they have to take it themselves with . We cut with , threatening to kill the two white stones at N16 and N17. They connect with . We push though with , threatening to kill all four stones at L15. They connect at L15 with . We push further with , still threatening to kill their upper side group. They connect with . We are running for our life, but so are they. MrTenuki: As a neutral bystander, may I point out one problem? Namely, White probably would not cooperate by trying too hard to kill the P14 group, but instead play at . That way, Black would have to either live small in gote (considering the ~30-point swing, tenuki may or may not be possible). Hi MrTenuki. It is a possibilty, but not actually a problem, given the scope of the issue at hand. The issue that I was trying to deal with is that the cut at N17 threatens to kill the P14 group and also to capture N18 and trash much of our top side territory. This can be answered in gote. The sequence described here allows us to tenuki with K9, making our cutting stone at J9 much stronger. If, as you say, we have to come back and protect in gote, that is still an improvement. When the choices are protect in gote, or protect in gote with K9, getting the tenuki at K9 is better, IMHO. We atari with , threatening to connect. They defend with . And we run to friends in the center with . If they cut at L11,we still connect because of the stone in the middle played 20 moves ago in this sequence. They cut with , we chase with . They extend with , we block with . The only way out is . We atari with , they capture with . We atari with . fills. is sente. And black is kicking tail like Bass wanted us to. Note that most of the moves played by white in this sequence end up being dame, or nearly so. We get (y) if we want to play safe, or a bigger move in the lower left if we feel like being risky. In summary: First we play P16 as a forcing move to get eye space. ( We have to play it _first_ because it is double sente. ). Then we play K9 as a forcing move to secure the connection in the middle if our upper right group has to run. Then we have guaranteed life for our upper right group and we can play a big tenuki. Nice job. I'm missing a white stone in this diagram however (white move 4). What happens if white has defended on N9? White 10 can be played on N12 too after N9. ...they can play P16 themselves with . We have two possible replies. We can play aggressively with like this, but they cut with . We have two groups with 2 liberties. They have one group with 3 liberties. We can never get enough liberties to win. They will kill one of our groups. We can play the safe way with like this, and we are connected, but then they still have the liberty. They have 4 liberties, we have 4 liberties. They move first and win the liberties race. Now we cannot make two eyes, so they can kill something with N17(v). If we defend at M18(w), they kill our corner group. Otherwise, they capture N18, and have a foothold for further invasion. The extra eye at P15 makes all the difference. Playing P16 first preserves that eye in sente. jvloenen: I choose N18 (a). Just following the path choosen. JoazBanbeck: If we must be wimps, let us be complete about it and connect submissively with O17(a). jvloenen: I choose O17 (a). I like to discuss later on. Now it is important to play consistently, so O17 is forced. Bass: I need to cool off a bit after having some healthy and entertaining discussions about tournament tie breakers, so I'll be staying off Sensei's for a couple of weeks at least. Other captains, please do kick some white donkey. Cheers! kanzenryu: The next guy will have some big shoes to fill in terms of video game related comments. kanzenryu: (a) O16 I think if we connect against the peep our Q16 group will die, so we need to at least threaten to connect, while making some eyeshape at the same time. fractic: O17 (b). Same idea as (a) but take a liberty. JoazBanbeck: Are we going to act like wimps? Especially when Bass requests that we impact white anatomy? Q17(c)! I haven't even bothered to read it, but it must be done. Anything else is just too submissive. IanDavis:I choose the first suggestion, I think c is all donk and no eye. kanzenryu: (a) F12 threaten to cut and kill the top left corner. JoazBanbeck: They can reply with E12. JoazBanbeck: O9(b). The ikken tobi is never wrong. It is especially good when they are preparing to stomp you. fractic: N16 (c), take points and hope the center can manage. Ted O'Mari: Give up the center for 2 big points. We play E2(e), they surround our center group, we play N16(c). Bass: I choose (b). I like Ted's idea of giving away the center stones, but we cannot let white grab the whole right side while doing that: sacrificing stones is an active task, just abandoning weak stones is not very useful at all. I dare not read it all the way to the end, but it seems (b) rescues the center stones or at least lets us comfortaby through to the right side. (c) (or the point above it) is of course huge, and a big point to play if we manage to get something useful out of the center in sente, but as long as we have the option of sacrificing all our upper side territory for the life of our wall, the center and the right side combined are just so much bigger. (e) is definitely one of the bigger endgame points, but we cannot play endgame while there are eyeless groups in important parts of the board. (a) does not work right now, as Joaz explained. (d) is so very much sente, that we can get it whenever we want, so we do not want to play it yet: one of the other forcing moves nearby might later prove to be more useful, so we should not choose before we are sure which one we really want. 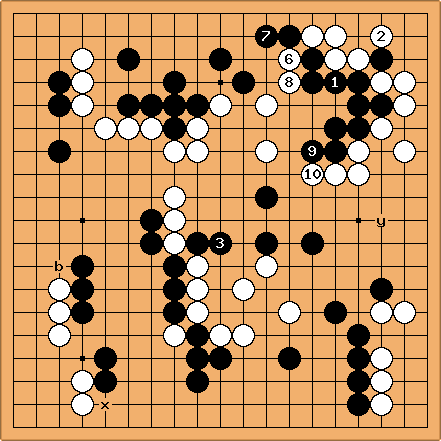 kanzenryu: C17 (a) does this work and grab a corner? JoazBanbeck: B-16(c) Why is everyone so willing to work right against their wall? We have one stone; they have three. Try to play away from strength. Step back and build our own wall. You want to get territory up north? A wall can influence that. You want to connect south? A wall can do that too. Bass: I choose (b). We cannot afford to tenuki after white answered solidly, so one of these moves need to be played. (a) surely does take the corner, but living there would hurt our positions on the sides. B-16 (c) is a very good local move, but I like (b) better: we will get the forcing move at D14 later, which somewhat limits white's options on the side, and we may be able to make C8 worth something. Also notice how white could build an emergency eye at D14 if we played anything else but (b); removing this opportunity may (much) later allow us an effective peep to seal white off the side. Now then, let's see how white attacks our center stones. JoazBanbeck: Grump. I don't like this one. If white needs an emergency eye, they now have it in the corner with C17. If we contest it with B-17, then B-18 is sente for them. And this version of the emergency eye makes more territory for white. Bass: No grumpiness in the rows :-) There's an additional problem with B-16, namely that B-14 becomes almost immediately playable. B-14 is also a weakness in our current position, but the way we played, white needs more backup on the side to make it useful. kanzenryu: C16 (b) wondering if we should switch sides of the board for maximum complexity. Bass: Maximum board complexity, now, that I like! I choose (b)! Seriously though, this move is a very good probe into white's position: it is a good idea to force white to decide what they want in the upper left before choosing whether we want to build the left side or not. Even besides that, (b) is huge in terms of points. While the timing may not be optimal (we will probably get punished for our weak middle stones), I like (b) so much that I dare not let the opportunity slip. The problem with (a) is that it does not actually connect our stones, and (c) would make our center group more heavy and inflexible: now we can, in theory, save just one of the middle stones for a good result. If we spend a whole move to add a stone to the group, then we must really save every last stone of it, and to get a profit, we also would need to be able to attack the white group we cut off. This is impossible, because if we cut, white can defend while attacking us. So in this situation, it is better to keep things fluid and each of the center stones individually sacrificable. thanatos13: don't worry about this move, it's very awesome. We can be punished, but if we take sente in this sequence, we would have a very good chance of winning (i think). JoazBanbeck: With and in place across the top, C8(a) just became big enough to justify letting the stragglers in the center fend for themselves for another move. Ted O'Mari: Those 'stragglers' are all that prevents white from taking a 30 point moyo. If we don't play O9(b) now they may not be there for another move. schroeder: @Ted: do you mean O9 or O8? Ted O'Mari: Neither. Too many beers lats night. Change to R7. JoazBanbeck: I still think that we can grab territory. I've always depended on the kindness of stragglers. schroeder: Hoshi at Q10 (c). Dansc: I feel we should defend our weak stones now as well, but I'm having a hard time finding a move that doesn't seem too passive. Perhaps Q8 (e) is the one - if I'm reading correctly, it makes connecting to either the top or the bottom miai while also being a pretty big move. kanzenryu: G10 (a) more territory? JoazBanbeck I really do not like forcing them to make the cutting stone stronger. This could come back to haunt us. One move like O12 by white and we could be losing a group in the middle. Those three stones need some friends. R7(b) is the only way I can see to give them a friend in sente. fractic: I suggest probing with R5 (c) followed by S5 (x) and S4 (y) before helping the center stones. JoazBanbeck: Good point. But S4 is gote. I prefer R5, S5, R7. fractic: S4 is most definatly not gote. It's intended as a probe, if White plays S3 we have more leverage on the outside. If white plays S6 instead we have good endgame later and can find other things in the center. schroeder: I guess it is always the right time to suggest E2 (d). jvloenen. I choose G10 (a). It is sente and builds our position on the left. (Imagine our position when white gets this point). R7 (b) is a very big point. In fact I'm suprised it is not suggested before. R5 (c) is aji-keshi, we don't have a (sente) follow up move, and maybe we like to play S5 later on (the chance white play R5 itself is close to nil). E2 (d) is an endgame move. Dansc: J10 (a), extend and threaten to capture the cutting stone. fractic: K9 (b), the other extension. kanzenryu: BTW that Atari Connect link was awesome. Bass: I choose (d). If we play anything else, then white will play (d), which will be sente in most cases, and very useful for white in every case. J9 is a very light stone, and we can give it away with no regrets, since white has already taken gote to protect their center group. Since we can press the right side, the other center stones can connect out, so after we have sacrificed J9 to our heart's content and connected the other stones out, white will have very little territory in the center, and our forcing stones here will almost be worth more. fractic: J4 (a), connect against the atari. kanzenryu: (a) H8 More of the same? Joaz Banbeck: Play D8(a) and thank them for the Xmas present. 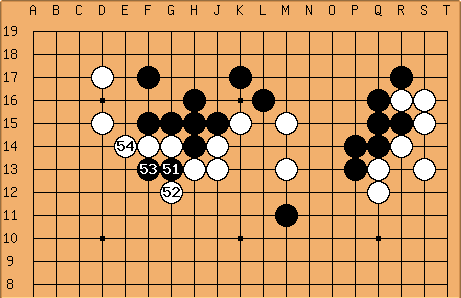 kanzenryu: J6 (b) threaten the weak group before playing a big move. Bass: I choose (a). While I really like (b), we cannot let white hane at the head of two stones here. (a) makes (b) a bit more interesting for us while also threatening to turn on the side. Joaz Banbeck: J6? did you guys mean H6? jvloenen: J6 spoils the white table shape. H6 is submissive. So J6 makes sense to me. Joaz Banbeck: Nvm, I'm misreading coords. Joaz Banbeck: The dark side needs a little more power at N9(a) to prevent a white hane there. Ted O'Mari: Let them run. Make profit while chasing them. If we chase them to the right, their lower right corner may die after Q2 (c). Bass: I choose (c). White is already nearly alive, so the other suggested moves would most likely end up as occupying dame points. Lacking any useful immediate attack, we have to wait for an opportunity to arise, maybe we get to attack from a more useful direction later on. kanzenryu: (a) N4 White has a miai at N4 or N8. I'm thinking fill the lower one which will assist with connecting and keeping territory. thanatos13: (b) P8, while viciously attacking the white group, we could also take some influence to reduce white's strong right side. We might even be so strong that we could attack the bottom right group. JoazBanbeck: Lamentations? Is Arnie going to raise taxes again? Bass: I think we were supposed to be stalling to get more suggestions (see WuRenGo2/Discussion), but oh well :-) You did not update the board, I'll do that now. kanzenryu: I wonder if the moves chosen from my suggestions will be as harshly criticized as in WuRenGo1. I didn't think that move would be selected! JoazBanbeck: I like Ted's H7(a), for sooner or later we have to seal the stones in. If they start running west, we could have problems. Their simple tobi to G7 is sente, being both a ladder-breaker and a geta-breaker allowing them to push through at D5. D7 followed by H9 almost guarantees that they escape. Black H7 not only has distinct tactical advantages, but it is also is theoretically good in that it pushes their weak stones toward our strength. Joaz Banbeck: If this group lives with no penalty for white, much of our hitherto superior influence will have been dissapated. We need to pick a fight soon, and a vigorous one. I like K6(a). Ted O'mari: Lock them in. We need H7 (b). rabogo: At this point we should play strong, simple moves to keep up the pressure while limiting white's opportunity for sabaki. K4 (c) is such a move. Bass: I choose (c). I really wanted to play a move like (b) to confine white to one side or another, but no matter how hard I try, I can't see how the would be more useful for white than is for us. (a) is a bit too dangerous, I think. If we were going to make full use of it, white would get millions of ataris in all directions, so they might even be able to live on the lower side by a sacrifice techique. Dansc: K8 (a), make white heavy before deciding what direction to attack from. Also, a stone at K8 will make escaping towards the top a lot more difficult for White, and if they neglect to answer the peep, cutting off is big. schroeder: I'm not sure about the peep, because I don't like their sabaki-answer at L9. Thus, I suggest L9 (b), keeping them away from their thickness. Bass: I choose (a). If you were standing on the board at , then north would be the only direction where you can see strong friendly stones. (A faraway glimpse in the north-east is also visible.) If we block the most obvious escape route, white has to do something else, which will probably include a lot of wiggling, and if we are careful, some profit for us. schroeder: Wow, that was fast :-) I think with this deep invasion White makes the game still playable for us, what other soldiers think? Joaz Banbeck:The move seems ok, but yes, it was fast. jvloenen: I agree the game is very playable. Not by this white invasion, I think after the 53-55 sequence we did have very good prospects, so white had to invade. Dansc: D7 (a), staying ahead. JoazBanbeck: It is hard to find a sane alternative to D7. But if Thanatos is right, then F11(c) does much the same for a moyo as F10, plus it is sente to cut at G13. Bass I choose (a). White is pushing the cart from behind, so let's play along. fractic: D6 (a), I don't want white to be able to attack while running in this direction so let's play here first. JoazBanbeck: I agree that needs to be protected, so I suggest the textbook extension at C10(b). It lives easily because B-15(x) and D6 are miai. rabogo: Settling for B 15 (x) to survive seems a little submissive - wasn't one of the points of playing Black 51 that it makes the peep at C16 much more severe? If we don't peep there, it seems that we are letting white get away with not defending. I don't suggest we peep straight away, though, I think we should play D6 (a) first, and if white subsequently attacks Black 51 from the outside then we peep at C16 and see how they handle it. I offer the peep at C16 (c) as another option for our captains. Bass I choose (a). I completely agree with rabogo. Everybody, please read the reasoning above, I could not have put it better if I wanted to. kanzenryu: Wow. I wish I could understand this stuff. The hilarious part is that to me it sounds like terrible reasoning, which just shows how poor my grasp of this sort of thing is. JoazBanbeck: I like G11(a) for reasons decribed with diagrams below. schroeder: I will suggest the cut E14 (c), because if White play there, he starts having a moyo. @Joaz: in your analysis, is really a ladder breaker? There is still one liberty left in H12 for the group. JoazBanbeck: Ooops! Maybe E14 is ok.
Ted O'mari: F12 and G11 are too close. I will suggest G10(e). Bass: I choose (f). It is the only suggestion that even remotely resembles a tenuki. I agree with Joaz, we might have trouble with an immediate cut-and-attack strategy. However, all the suggested peeping moves force white to connect, which makes the cut and attack impossible for us forever, even if things happened to change at other parts of the board. This is called ajikeshi, and should be avoided: as white can only remove the threat of the cut in gote, there is no need for us to force the issue right now. Looking from a tewari angle, if white were to add a stone here to secure their connection, would we immediately want to play a gote move at any of the suggested peeps? rabogo: Out of curiosity, Bass, would you have preferred D6 which was another option I considered? JoazBanbeck: Probably not. C13 backs up the cut at E14, whereas D6 doesn't. rabogo: *sigh* - well, if they happen to miss it, please remember later to tell us what it was! If we start with , they can play . is forced, else white gets the better part of an eye. They play . Now our little group is engaged in a life and death struggle with a bigger one. And they are a stone ahead when we both start running into the middle. This looks bad for us. With the other cut ( or what will be a cut if they crosscut ), white will almost certainly be alive in the middle. Then a move like 'a' isolates our wall, and the resulting fight in the center looks bad for us because is strong. So, with one cut leading to disaster, and the other leading to unpleasantness, I conclude that attacking is premature. Both variations lead to the middle, so let's get something out there first. With a move like G11, either variation looks a lot better for us, so it is sente, and we can start grabbing big territory in the middle. BTW, G11 may not be best. Something nearby may be better. Joaz Banbeck: Anybody counted the diff of ko threats? fractic: we've got a few good ko threats but I'm still going to suggest just connecting at H15 (a). White has two cutting points left. kanzenryu: Surely after White plays K13 we have no cutting points left? fractic: If White plays K13 we can peep and then cut at G13. We also have the hane at E14. Bass: I choose the solid connection (a), because white would gain big by winning the ko, while our gain would be marginal at best. The white shape now has a total of four (yes, 4) cutting points (counting the hane), so however they connect, there will be a boatload of aji later. Joaz Banbeck: I like J14. kanzenryu: Wow, they're taking a while on this move. Maybe they've forgotten that it's just a teaching/learning game? Anyway, do we just continue cutting and cutting in this sort of situation? fractic: I'll throw in H15 (b) which is pretty much the only alternative to (a). rabogo: I think J14 (a) is the only move. Bass: I choose H15 (b). This ponnuki removes any bad aji on our position, so after white responds (should they want to keep their reducing stones, they will), we are free to do whatever we want with a clear conscience. Also, the resulting white position is not without defects, we can probably exploit that later. a play at a would give us a liability: if white plays b, we have a new group to look after. Also, the resulting threat of pushin through to the side would leave us with a shortage of liberties that would forever prevent us from playing the hane suggested at the previous move. Dansc: J12 (c). Build the center while threatening a severe cut. schroeder: I support E14 (a). Alternative: Q2 (d). Why? If they take sente connecting in E14, we close the other side with E2, and after that we are leading in territory (is this true?). If they jump in our left almost-territory, we tenuki and cut them in E14. Joaz Banbeck: F15(a). Cover our weak spots, then attack. Dansc: J15 (c), aiming to cut white in a larger scale. kanzenryu: (d) F14 keep the suggestions coming. Joaz Banbeck: I really like F14. It is thematic and shows fighting spirit. Unfortunately it gets us slaughtered if played immediately. So I suggest G16(f) - an alternate way to cover the weaknesses first. It works better with F14 on our next move. jvloenen: I choose (a). Fix some cutting points, and hope for some forcing moves on the white group later on. For H14 (b) and J15 (c), we don't know which atari we want to play, so play neither. (Besides, white will sacrify for sabaki). F14 (d) seems an overplay, we're left with too many cutting points. L14 (e) probably cuts off some unimportant (as the cut at Q17 remains) stones. G16 (f) is the second suggestion by Joaz, so I ignored this. schroeder: Hane in G15 (a). thanatos13: I also support (a) but I give the wedge at J15(c). Dansc: The clamp at H14 (d) for a little bit wackier choice. It should lead to some rather difficult fighting, but I can't see a line that's obviously bad for us. Joaz Banbeck: Play cosmic with F11(e), which neutralizes white's wall while they are still building it. It aims at large territory in the middle, and supports the eventual invasion on the left side when it runs out. It is also a ladder breaker for ladders that originate when we try to cut white's central group. Bass: I choose G15 (a). While I really like the cosmic moyo idea, this is not the time: white could strengthen the weak group in sente if we played tenuki now. The wedge inside was my first idea too, but sadly it seems to fix white's shape more than it does ours. The clamp does not seem to work here either, white would connect through with minimal losses. F15 makes a shape with sever holes in it, so let's just follow the proverb. schroeder: Since I can't see any straight way for White to connect on the right, I will suggest the one-space jump to H14 (a). Dansc: Keeping the pressure on the weak center group is all good, but this might also be a good time to switch to the left side with C13 (b). fractic: I'll suggest M11 (c) a cap to keep attacking. I really like (b) though. Joaz Banbeck: I like M11 too. It attacks on a large scale, and then a move like P10(x) outlines big territory and threatens to invade white's right side territory. But since M11 has already been suggested, to give Bass some variety I'll add N14(d). It tries to make white heavy, and if white ever turns on us at P12, we can resist with O12 because N14 covers the cut at O13. Bass I choose M11 (c). It is the strongest direct attack against the white group, and it also is potentially useful later regarding our moyo on the lower side. Although C13 (b) is a standard invasion on the left hand side, white can respond with an iron pillar at C15, and any effect 33 and 35 have in the corner will disappear, while we would have to extend towards a low stone, which is somewhat boring. So let's see if we cannot tease the white group a little longer here in the center. In reply to Joaz's suggestion, I do not see any white territory on the right side..
Joaz Banbeck: I like O17(a). I think white has overplayed. We have no weak spots aside from the cut at Q17(x), and (a) protects that. It also deprives white of any chances of a base on our upper side. White is then faced with the unpleasant choice of either abandoning his last two moves, or starting a running fight where we have all the influence. Thus, (a) grabs about 15 points in sente. rabogo: I strongly support O17 (a) but offer C13 (b) as alternative. Joaz Banbeck: C13 was my second choice too. But it is a high-risk strategy. kanzenryu: N16 (c) maybe we should push out a little further. But the important thing in this sort of situation is DON'T PANIC! DON'T PANIC!!!! Joaz Banbeck: The problem with N16 is that white runs past it with M17, and then our wall is stranded and vulnerable. M17 can slide into its eye space, and there is still the cut at Q17. If we play N16, I will be panicking. fractic: Playing a defensive move like (a) or (b) is too passive. I like (b) but I really want to start a big fight so I suggest L14 (d) to start an attack. Joaz Banbeck: I like Fractic's idea of making white heavy so we can attack him. If L14 works, then so does L16(e) - and it starts to make territory with N16 later. Bass: I choose e (L16). We simply cannot let white play L17, which would build eyes in our sphere of influence while totally demolishing our territory potential *and* separating our position on the upper side. While our move feels a bit too defensive, we cannot allow white to play such a triple purpose move. kanzenryu: F15 (a) I have no idea of what a good move would look like in this position so I suggest trying to cut off this new stone from the left side. thanatos13: consolidate while attacking, (b) L15. I doubt it is the time for (a) right now, maybe after our moyo is relatively safe and the opponent's group is running that way. 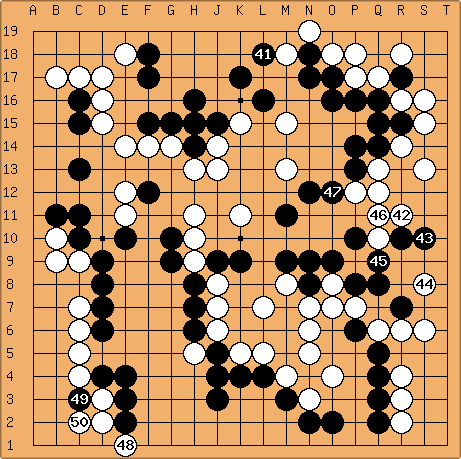 rabogo: I think that white H17 looks very severe now and therefore suggest that we defend at H16 (e). This greatly strengthens our own group and also threatens the severe follow-up at J14 or similar, should white choose to consolidate on the left side. Dansc: Let's start an all-out fight by capping at K13 (f)! Bass: I choose (e). A reducing cap needs to be answered with a keima, and the other keima was not suggested. A probe in the corner might also have been useful to decide which keima was preferable, but this way of play is simple and (sadly, a little too) solid. After this, we do not have anything to fear should an all-out fight ensue anywhere on the board. The moves that touch the white stone were not to my liking, we do not want to strengthen white needlessly, and if we defend our territory, it will be gote. So let's take it slow for now, and seek trouble later. kanzenryu: If white connects does that make his stones heavy or is that wishful thinking? Joaz Banbeck: C13(a). Now that we have the big wall over on the right, white's upper left shimari is affected by it. White would like to invade at L16 or M16. For our response to the invasion, crawling underneath is too submissive; we make him pay for it by extending along to G17. If we already have undermined his shimari, a black play - such as G17 - on the upper side of the shimari is an attack on it. So I propose defending our upper right territory by creating a situation in which he is subject to a double attack in the upper side if he invades it. And an invasion over on the left side is a good idea for us sooner or later anyway. fractic: I like (a) best but how about a probe at C17 (c)? kanzenryu: (d) C10 because I'm too chicken to play close to any white groups. Bass: There were plenty of good ideas. I agree with Dansc about the direction. If you think you will win the game should both just build their positions, then you should always prefer building to invading. The one to flinch first will have to fight near enemy stones, which is psychologically very taxing. I think we can afford to build, which (e) somewhat does. Also very importantly, the white shimari is facing this way, so a point around (e) also prevents a white extension here. As I think it is unfair to just wait until every nearby point is suggested, I choose (e), which is not bad at all. A probe in the corner was also tempting, but this way of playing is a lot more simple and straightforward, so everybody can understand what is going on, which is important in rengo-like games. fractic: I'll add my reasons for liking C13 more than F17. I think that F17 makes K17 look too low. If F17 is played first it would be better to play K17 high for better balance. I feel that the one point jump to K15 is a better way to develop our own position. Of course it doesn't hinder White. 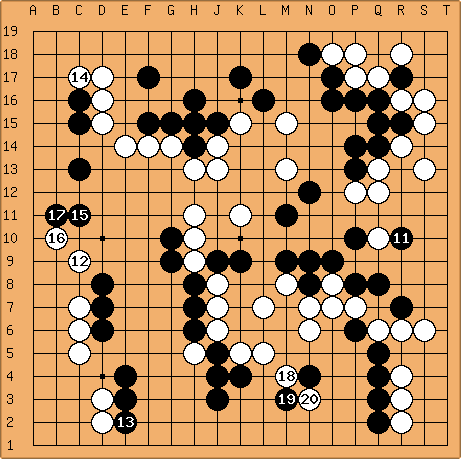 But if White gets the extension she induces us to take the nice point of K15. That's why I though the left was more important. I think C13 is better than C10 since if we play C10 white will answer from above with C12. If White pincers C13 she'd have chosen the bottom part which is less interesting for here since we can push it low. rabogo: Argh! I wanted to suggest G17 earlier (I had the edit page open) but got interrupted and didn't get back to it in time :o( I prefer G17 over F17 because it's more solid and not as close to white's thickness. Joaz Banbeck: "Argh" is my first reaction too. I would not have put this move in my top 10. But then I looked at it a bit more, and it is a good move. It works very well with an invasion at C16. When they try to extend down the left side from thier shimari ( and they must do it soon too prevent our C13 ) we can invade at C13 and C16. fractic: Let's not omit P13 (a). Joaz Banbeck: R17(a). It is sente, it is big, and it is joseki. schroeder: R17 (a) for me too is the correct move now. Just to give an alternative, I propose K14 (b) to build a central moyo. kanzenryu: I support (a) but propose (d) C10. But let's just play (a)! Bass: Yes, let's. I choose (a). schroeder: Connect at Q15 (a), of course. jvloenen: Play Q15 (a). No choice. Joaz Banbeck: Do we have to wait on white? Can we do a trigger? It is likely that the white team will play R15, and that when they do we will have to play R16. kanzenryu: I'm nervous about white grabbing the entire left side. Joaz Banbeck: That is not an unreasonable concern. But white cannot seal it with one move, so we can always invade. A higher priority are the things that can be done with one move ( like us sealing the corner with R15 if they let us ). kanzenryu: (a) R17 woohoo I can make this look like it was my idea! Joaz Banbeck: It IS your idea. And a good one too. For the sake of variety I'll suggest R13(b). fractic:I support (a) but R15 (c) is another option. thanatos13: I support (a) but give R12 (d) as an option. schroeder: I support R17 (a), but give Q17 (e) as another option. jvloenen: I choose (c). Playing on the uninteresting side and give white the fourth corner makes no sense to me. That's all to say about R13 (b), R10 (d) and P13 (f). Q17 (e) is very submissive and isn't the right choice as we behind on points. Most of you support R17 (a). I don't think this is correct however. If we follow the joseki R17, R15, Q17, R10 the K10 stone is just on the right place, which would be great (a correct extension and sente). So white will not play this variation and answer R17 with S15! We'll get some extra points in the corner and gote. As the left side is bigger, we better let go those points for now and try to get sente. So I choose R15 (c), to give white some cutting points. Joaz Banbeck: I think that R15(a) and P14(b) are the only reasonable suggestions. I like R15 a little more because white's resulting influence does very little for him due to our P6. Whereas P14 gives him even more territory. If we had K16 instead of K17 then P14 would feel better. jvloenen: I choose (b) (I don't think more suggestions will follow). After R15 (a) white will get P14 and we can exploit the cutting points. As the left side seems more interesting, (a) makes no sense. Now we have P14 and K14 and the corner start to get some relation. thanatos13: High pincer at Q11 (a) because it looks cool and fun. rabogo: I think this is an interesting point in the game. Without necessarily fully understanding why, my feeling is that white's move was a mistake. White chose to play on the least interesting side, and their position on the right side as a whole is very low. I suggest we attach on the side with Q14 (c) to keep their position low and build up a position of our own in conjunction with K17. If white takes the corner after the usual hane/extend exchange, then we get a good attack on the approach stone with R15. If not, we build up a good chunk of territory in the top right, while white's thickness faces down the right side and will be difficult to put to good use. fractic: I'll vote for the footsweep at S15 (d). White already has 3 corners it's time to take one ourselves. Joaz Banbeck: http://eidogo.com/#1VFtQJ:0,22 is enlightening. ThorAvaTahr: Thanks for the nice example. However, the position in the pro-game is different on an essential point. White can push up at the bottom right. He can get a wall and make the right side interesting and big. In the position in this game it is not possible to do something alike, therefore the right side is uninteresting and low. kanzenryu: (f) S16 don't encourage the weak stone to get stronger. jvloenen: 6 suggestions, time to play on! I choose (c). Let me first say I never thought white to play at R14. If one of you suggested this move, I would say this is not good because of the low position of R6! Both white captains are a lot stronger than me therefore I assume I'm missing something important. So I cannot say is wrong, but let's play on as if is too passive and black has a possibility to get ahead. If I count (I'm not very good in counting during the game) I think white is 5 - 10 points ahead now, and we're to move. So we need to fix the upper-right corner in sente and invade the left side to get a nice position. We all agree to play in the upper right corner, which seems obvious to me. If we assume wrong, Q11 (a) and Q12 (e) are not good too. The white stone R6 is low, so we cannot attack this group. Q11 and Q12 are too far from P6, so they're not helping to build our moyo. Therefore these moves will only restrict the white right side, which we assume to be too small. R15 (b) will leave us with a weakness in the top group, as I think K17 is one line too far. I think it's better to invest more stones, by playing another joseki (the white group will be stronger too of course, that's the price to pay). S16 (f) has the same problem, we're left with a weakness on M17 or P17 later on. Even more, if white replies with the slow R11, we don't even have sente%%%S15 (d) is an interesting move. I thought about it a long time and I'm not sure we will end with sente. I think S15 is followed by R15, R16, S14, N17, and the white group almost lives so white can play on the left side. (btw: white is playing on the third line almost all moves. If we play on the second line, we're following white. It feels better to play on the fourth line, pressing white down and helping K17 a little). ThorAvaTahr: I agree strongly with this quote "So we need to fix the upper-right corner in sente and invade the left side to get a nice position". However, given this, why do you chose to start a joseki in which you normally get gote? jvloenen Hm, good question. I hope K17 to be close enough to abort the normal joseki continuation. Which of the suggestions do you like to play instead of this ? ThorAvaTahr:I would have rather played R15, I agree that it doesnt do much for the upper side. However, it does sufficient to take sente. After white plays nobi at Q15, black plays O16 and white would need to extend to R10 or prepare for a severe attack. The position on the upper side is than so stable that black can take sente. The upper side hardly makes points due to the fact that two invasion points remain, but it is too early for white to invade there. Also we will keep white busy on the important side of the board. I see. I thought about R15 and wasn't sure white would answer. Therefore I decided to play this variation, so white would end up with three stones instead of two, so it would be more difficult for white to leave the stones floating. Dansc: Before we do anything else, I really want to punish white a bit for playing the aggressive instead of defending more solidly, and force with R8 (a). If white defends, we can either just leave the stone as a big kikashi or use it to seal white in the corner and build the right side. If white doesn't answer, we get to play Q2 in sente next, which would be huge. Joaz Banbeck: D6 has been huge for both sides. Now our J5 makes us overconcentrated if we play it. But if we leave it for white, then it works well with D15. So, having neglected it, we may be committing ourselves to an invasion around C11. When we invade, white will get stronger in the upper left, and an extension off of that strength will be big. It could be anything from K16 to O17. So I propose K17(b) to contest the inevitable by being there first. Joaz Banbeck: Q2 is sente after R8? Sorry, but I don't see it. rabogo: K16 (c) for the same reasons as K17 (b). In addition, I think K16 works better with our thickness on the lower side, it sits better with white's high shimari, and most importantly, if white plays H17 next, we have less of a need to defend locally and can instead switch and attack white's shimari from the left side, preventing a double wing formation. Joaz Banbeck: It is precisely the threat of H17 that led me to go low. It can undermine K16 with K18. But if we are at K17, we have easy extension to N17 if we have not developed the Q16 stone, or moyo maker at K15 if we have. kanzenryu: Only just noticed that we have lost three corners. So I propose (d) O17 to do something close to securing the top right. thanatos13: c10(e) looks HUGE! We don't want white to get the corners and a whole side and also use that influence against us. the good side is, if white attacks from the bottom, we can trade part of our moyo for the strength of their top. schroeder: I agree on the fact that we should avoid the left side to become completely white. Moreover, I think we should start playing more aggressively because I think we are behind. The lower left side is thinner and lower than the upper left side, so I would play directly on (f) C13. fractic: I'll throw in J17 (g). It diminishes the value of a white extension but doesn't coordinate as well with our 44 stone. I don't think the left side is urgent since White can't turn it into territory with just one move. jvloenen: All active soldiers suggested their move, so it's time to play. I choose K17 (b). R8 (a) isn't the right move now. Maybe we like to expand our moyo/push down white on Q8 later. So it's invading the left side, or taking a position on the top. The top is the natural extention for white, so we want to play here. Also a move on the top is an extension from our Q16 stone. And it is the biggest area anyway. Invading the left side is, well, just invading. We will create a living group without making much points. Besides, white cannot close the gap on the left side with one move, so we can reduce later on. Playing on the top side, a 3th line play is correct now. We need to make points. After K16 (c) or J17 (g) white can easily invade at O17, and we will have nothing (but troubles). O17 (d) is too slow, so (b) it is. I think it is one step too far however. The game will be hard from now on I'm afraid. fractic: Do you really think K17 is one space to far? I would have played it myself but put in J17 as an alternative. I would think holding back to L17 is not good since it lets White get a great extension to J17. But after this extension the black 4 space extension is just as open to invasion as the current 5 space one. jvloenen: After K17 the sequence H17, N17 can be expected. The K17,N17,Q16 formation is far from perfect I think. N17 at O17 or N16 doesn't help much. If we look at the white shimari as a two-stone wall, the white stone at H17 is placed properly, so white will play C12. Now we can take points with R15, and white will play around D6 makeing point on the left side, and we don't have enough points. So R15 is not playable and we need to invade the upper-left corner. If we had played L17, followed by J17, O17 and C12, our formation in the upper-right corner looks better (less need to return here locally). The white upper corner is more open, so an invasion should be easier. fractic D6 (a). I think we should flatten white here to attempt to make the best use of our new wall. Joaz Banbeck D6 is probably the best move. But I'll suggest Q8(b) as an alternative so that the captain has some variety. Dansc: I'm not too thrilled about (a) at this point. Our moyo has a major defect at K4, and if white takes sente and plays there, with our two open skirts I really can't see how we are supposed get enough compensation for the two large corners we gave white. Therefore, I suggest defending at J5 (c). It makes a perfect shape with our two stones on the left, doesn't seem overconcentrated with the wall on the right, and removes all the obvious defects in our moyo. rabogo: I think Dansc makes a very compelling case for J5 (c) so I would like to second that recommendation. To provide a different alternative for our captains, however, I suggest Q2 (d) which closes off one skirt and perhaps strengthens our position enough that attacking a white shoulder hit at K4 becomes feasible. kanzenryu: (f) R10 go for the right side. jvloenen: I choose (c). We need to do something with our moyo. White has about 25 points of sure territory (with both sides of the white groups low, expanding isn't a big issue), so white at K4 is end-of-game. Therefore Q8 (b) and R10 (f) are not possible. Closing the side at Q2 (d) is doesn't make sense while our moyo is open at K4. So it must be (a), (c) or (e). J6 (e) seems to be the faster move, though it probably will turn out to be slower as white has a lot of probing and forcing moves, forcing to strengthen our moyo with another move. (I don't know how exactly, just a feeling). D6 (a) is not sente, so white will jump in at K4 or M4 before returning at C6. Therefore I prefer the slow looking move J5 (c). Next D6 will be a very large follow-up move. If white plays here (at E6), it probably isn't sente, and we finally get to play Big Points elsewhere. Besides we have Q2 to make 30+ points in gote. Dansc: Q5 (a) is joseki. Strengthening the wall and fixing the cutting point in sente. Bass: I choose (a). Always finish up your joseki. thanatos13: I also vote (a), i give c15 (c) but is it possible to tenuki here? or more importantly, is it worth it? (c) doesn't look big enough for a tenuki imo. jvloenen: Bass has played move 15 already. The board wasn't updated yet however. Fixed it. As for (b) D6, this is a key point certainly. We need to fix the right side first however, especially if we can do it in sente. (c) C15 is a big point. Playing tenuki during a joseki is very difficult, and can be used to decide how to continue local play, by playing elsewhere in between (the answer to C15 -if any- will not alter our choices here however). Besides C15 isn't "sente enough" (just because there is a joseki starting with C15, white D17 and black to play) for sure. I agree with (a), fixing things simple, so we have a good chance to get sente to fix things up. fractic: Q3 (a), we should block on a side. I vote for the bottom. jvloenen: I choose (a). The only move of course. Dansc: O4 (a) seems natural to me. We'd really like to have sente to press the left side. If white ignores O4 to play on the left, O4 is in a good position to switch to the right side and attack instead, and if white does answer on the right, our bottom side looks pretty strong after we press down on the left and build a wall. isn't an optimal extension from O4, but close enough, and if we next press on the left and build a wall facing the center and bottom, white really can't invade too deeply anyway. kanzenryu: R8 (b) Them's fight'n words! rabogo: P6 (c)! This coordinates well with our group in the lower left and lays the foundation of a promising moyo. At the same time, it pressures the white kakari enough that they are unlikely to tenuki. If white answers locally, E6 looks attractive. O4 (a) would be OK but doesn't achieve as much as P6. I don't like R8 (b), as white can take the corner in sente and cap J3 to flatten our framework. Joaz Banbeck: Over on the left side, E6 or D6 is locally very big. ( And, BTW, I think we can play the more aggressive D6 because J3 makes us strong enough to tolerate the cut that follows. ) Thus we really want to come out of the lower right with sente so we can play in the lower left. With this in mind, and considering the development that we already have on the lower side, I suggest Q6(d). It almost forces white into the 'attach-and-extend' joseki in which he finishes in gote. This joseki works for us because J3 is almost in the theoretically ideal spot of K3. I don't like the R8 pincer ( or any other similar pincer, for that matter ) because it encourages white to run across the top of our impending moyo, where a white move like J5 serves a dual purpose both as a running stone and as a cap. kanzenryu: I just want to say these explanations are great! I only wish I could think of anything to say about my suggestion (e.g. why that move instead of any other). thanatos13: Q9 (e): for no apparent reason other than i like high pincers XP. jvloenen: Ok, it's time to move I guess. After 8 suggestions for move 7, and 6 for move 9, we had only 4 suggestions so far, so I was just waiting for more soldiers. jvloenen: I choose (c). O4 (a) is joseki in the local context. It doesn't work well with our other three stones on the lower side however. No corner, a gap on the lower side and not enough influence. R8 (b) doesn't feel good here either. White will enter the corner and we get Q3 (as we don't have a stone around Q10) and a wall which isn't fully working with the three stones. Q9 (e) is just another joseki which doesn't work well in this position I'm afraid. White will play P6, removing our influence and settle easily, while we're left with a lot of stones without much potential. So I feel we need to play P6 (c) or Q6 (d) (P5 - not suggested could turn out nice too), building something from our stones on the lower side. I don't know which move is the better move. I choose P6 (c) just because I've never played this move before. kanzenryu: BTW please list your move rather than just giving a letter. Otherwise when the letters on the board are removed after a move is selected it is hard to see where the other suggestions were. Thanks. Dansc: E6 (a). Somehow I feel that simply extending along the side wouldn't be enough compensation for giving white a big corner. Our plan was to play for influence, so let's build some on a larger scale. schroeder: I would press with D6 (b), reasons are the same as Dansc suggested (W corner too big for a narrow 3-space extension now). fractic: How about a direct extension to K4 (c). One space to far from the wall but working better with the hoshi stone. thanatos13: I vote K4(c), but bring up the tenuki at D15(d). kanzenryu: E2 (f) I guess somebody has to suggest it. thanatos13: sorry, I didn't like my previous decision, i think a step closer to the wall at J4(g) might be a tad better. jvloenen: I choose (e). After E6 (a) white will probably invade around J3, and then we cannot take over the left side because D17 is white. D6 (b) will be followed by D5, E5 and then cut. We're not strong enough (yet!) for this. D15 (d) is big, not absolute sente however. White will play around J3 immediately. E2 (f) doesn't help us much in eyespace or whatever. It seems (big) endgame to me. K4 (c) tries to help both sides, which does not work and we end up with two invasion points. Better to help one side for sure, leaving only one (bigger) invasion point. Both J3 (e) and J4 (g) do help our two stones with the correct extension. I think we have a better balanced 3/4th line position with J3. Also after J4, and a white invasion at O3, white will probably get Q2 and L3, it seems our group is floating. JoazBanbeck: E3 (a). Anything else just gives White the whole corner and eviscerates when white plays it. Later, E6 works well with the black stones on the right. kanzenryu: (b) D6. Lean on a white stone. Dansc: I believe (a) is the only move here. kanzenryu: Aren't we supposed to come up with alternatives for the captains rather than just voting for a move? I feel (a) is the best, too, but surely we need to generate options each time. (Don't call me Shirley ;-). thanatos13: There is nothing more urgent than (a). the captains wouldn't choose anything else anyways, so what's the point? schroeder: I think (a) at E3 is not sente: if we play (a), they will not let us extend. So why we don't extend right now? I propose we play (d) at K4. jvloenen: I choose (a). Locally this is the only move. D6 (b) doesn't feel good right now. Whites profit is just too big compared to the influence we can build. Both Tengen (c) and K4 (d) seem playable to me if was not played yet. The choice of gave white a lot of local profit, so we should continue and play consistent. I agree with kanzenryu to give alternatives all the time, even if you think the best play is a suggestion given before. Just vote A and suggest alternative B.
Dansc: I really want to prevent one of the possible white enclosures, as playing something like a sanrensei is not really my own style. Approaching the lower left corner invites white to press and build a moyo on the left, so I suggest (a) at D15. schroeder: I would go for sanrensei, for the following reasons. If W approach with O17, then W is flat on the top. If W approach with O3, then O3 and are unrelated. 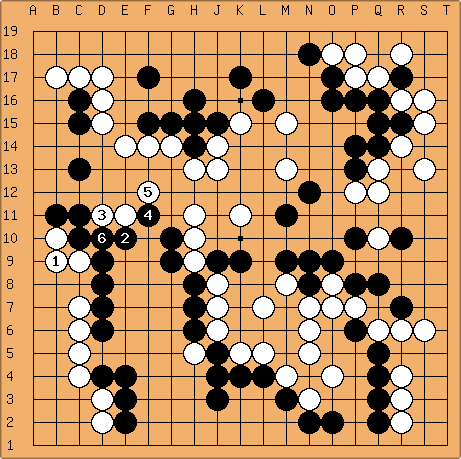 Finally, if W makes a shimari, let's say at D15, then we take the extension around K16, and W has no good continuation. Similar for the other shimari. Thus, I suggest (b) at Q10. fractic: I'll suggest E4 (c). An influence oriented approach to the other white corner. thanatos13: personally, I'd go with D3 (d) to take the corner and make things workable. kanzenryu: (e) c11. I like (b) but I'll suggest invading the left for variety. IanDavis I chose c, it's the last move I can pick for a while. It just looks to give a nice moyo based game. kanzenryu: (a) q4 go for opposing corners for a fun game. Dansc: Let's play cross hoshi (b) for fun and giggles! Reuven: Q16 (a): Lets start with a standard 4-4? Or would you rather have sometihng more "exotic"? fractic: I'll throw in a 3-5 point (c). tapir: I want to learn about the 4-5 point (d). ictus: I'm feeling (d) as well. has some fun variations.